Some guy I don’t know reading Decibel magazine, November 2013, page 14. 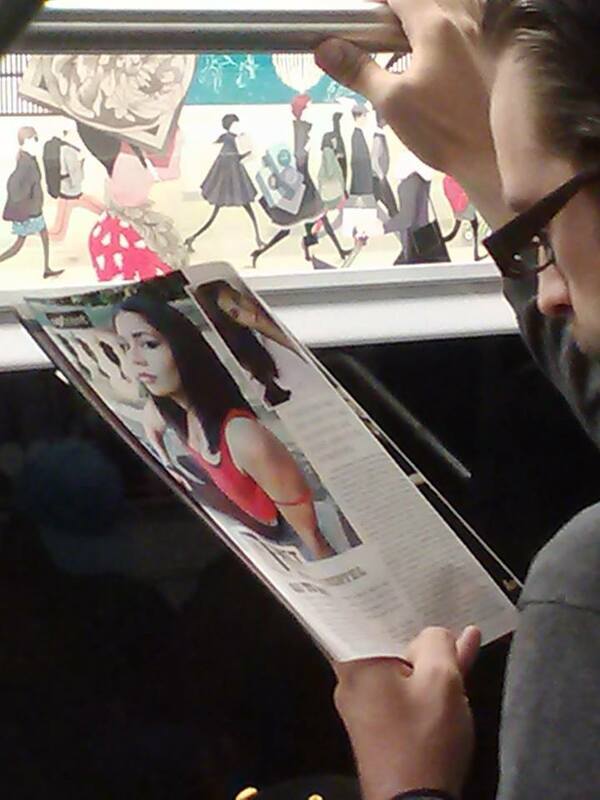 This is a picture taken on the NYC subway of a stranger reading my “Closet Metalhead” article about Alekhine’s Gun singer Jessica Pimentel (who also stars as Maria Ruiz on Orange Is the New Black) in Decibel magazine (November 2013, page 14). The photographer is someone I don’t know. He/She uploaded the image to Facebook and tagged Jessica. Jessica then tagged me in a comment. The satisfaction of having published an article is not nearly as satisfying as learning that someone actually read what you published. Throughout my not-exactly-illustrious-yet-still-admirably-prolific career as a music journalist, proof of someone having read anything I’ve written has proven to be elusive—hate mail being an exception. This person doesn’t appear to hate what he’s reading, which, I can guarantee you, has less to do with my writing than with Jessica Pimentel’s existence on this planet. Still and all, a small victory—one I’m celebrating. THE IRONY OF IT ALL is that MY BYLINE IS MISSING FROM THE ARTICLE.